so far so chic: What's in my Makeup Bag? As I love it when other people (such as the fabulous Le Salon De Beaute) write or vlog about the contents of their makeup bag, I thought it was time I did my own. Get ready for some blushers! Laura Mercier Cheek Colour Duo in 'whisper'. Katy at Make-up By Katy gave me this as a thank you for working on her CV. Very kind of her I know, and I absolutely love it! This was the compact that got broken by my oaf brother, and which I reformed using the surgical spirit technique. It didn't look quite so pretty afterwards, and I think it wore down quicker than usual due to the presence of air pockets (bit scientific ain't I!). I usually sweep the brush over the bronze side and use high up on my cheekbones, before applying the pink on the apples of my cheeks. Has been known to last ALL DAY. Brilliant. Laura Mercier Crème Cheek Colour in 'oleander'. 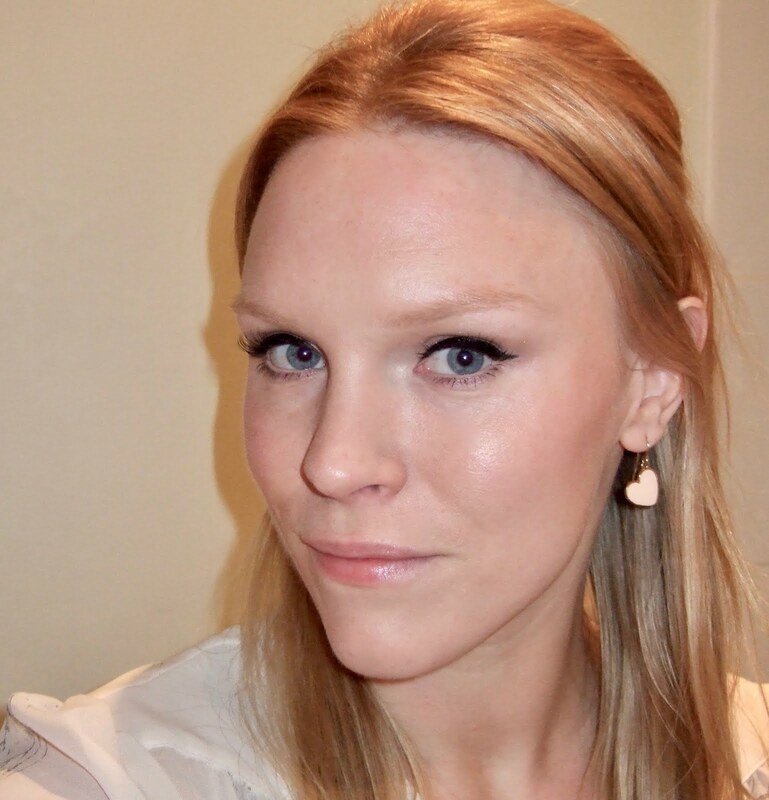 This cream blush is a light pink colour with a bit of white in it, which creates a baby pink flush on the cheeks. Especially pretty if you have a tan (real or fake). Elf All Over Colour Stick in 'pink lemonade'. A friend bought this for me and it's a handy all-rounder. The colour is a pinky-rose shade and the finish has a tiny bit of shimmer, which looks gorgeous on lips. Nars Cream Blush in 'cactus flower'. This looks scary bright in the compact but once applied it produces a wearable bright coral red. It is a bit shimmery, which I don't mind on cheeks and you'll probably only need to buy one per lifetime; it lasts forever. Clinique True Bronze Pressed Powder Bronzer in 'sunkissed'. I blogged about this a while ago and my sample is still going strong. It's small enough not to take up much room in my makeup bag and the compact is the same size as my Bobbi Brown bronzer brush head. Does exactly what is says on the tin; creates a sunkissed glow. Clarins Wonder Perfect Mascara. I also blogged about this when I bought it. It's on its last legs at this point and is rapidly drying up. Despite raving about it in my review and continuing to love it as the months went by, I still cannot stand the packaging. I was also very unimpressed with the unsightly 'gooping' on the neck of the tube. I'm on the lookout for a suitable replacement with more aesthetically appealing packaging. Prestige Classic Eyeliner in black/brown. Another one I've blogged about! This is one of my firm favourites and a pencil I use every day. Bourjois Black and White Kohl and Contour Duo eyeliner. Nothing amazing about this one, but handy to have on-hand because of the two colours, and it gives soft, blendable colour. 17 Soft Liner Pen in black. This felt-tip liner is perfect for 60's-style feline flicks and it only costs £3.99, which is ideal seems as I go through these pretty quickly during liquid-liner phases! Bobbi Brown Moisture Rich Foundation SPF 15 in 'Porcelain'. This has been a life-saver over the winter while my skin has been dry, dry, dry. I think it might be a bit too much during summer though, and would probably slide off. I'm impressed with BB so I'll probably look into one of the other foundations in the range. Laura Mercier Illuminating Tinted Moisturiser SPF 20. This really does give skin a 'lit from within' glow thanks to a super-fine pearlescent quality. It also provides a bit of coverage to even out pink bits, and can be used in conjunction with foundation for more coverage. Only negative is that I'm not convinced the 'glow' lasts all day. Natural Collection Duo Eyeshadow in 'mocha/latte'. I got this when I exchanged the crapos Revlon DoubleTwist Mascara. The pale shade is a good neutral to use as a base; the brown is a bit muddy but it's ok for the crease. MAC Eye Shadow in 'tempting'. I bought this after a makeup artist used it on me during a makeup lesson. The colour really makes blue eyes 'pop'. I'm not impressed with the texture though - it's a bit glittery and uneven. My one and only bit of MAC. Prescriptives Flawless Skin Concealer. Not much point in me banging on about how amazing this is now that you can't get it anymore. You can read about my quest to bag every compact in the county here. Paul & Joe Lip Lacquer in '05'. Zuneta sent me this to test and review for my guest blog on the site. Sheer, peachy colour in a super-shiny and surprisingly long-lasting finish. Always impresses people when you pull the posh tube out of your bag too! And that's all folks! 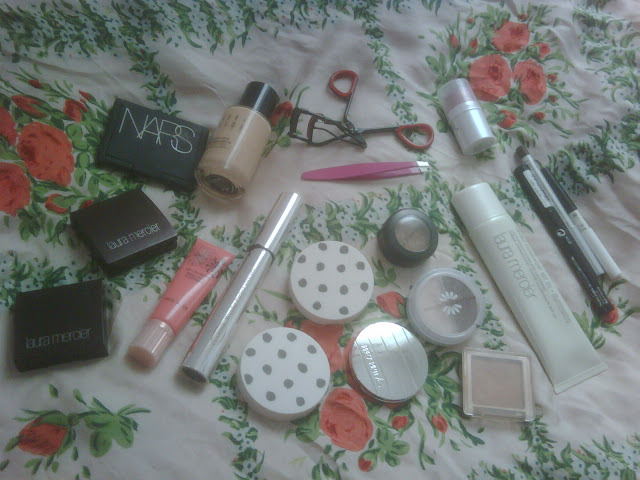 This is all that resides in the bathroom next to my makeup bag (which is usually empty). If I were to take it with me somewhere I swear I wouldn't pack six blushers. I'd pack three. If you fancy doing a post on what's in your makeup bag, be sure to link me to it in the comments so that I can have a gander! love the post! lots of goodies....i fear that the blog would be 2 pages long showing what's in my bag, lmao. Way too much stuff.